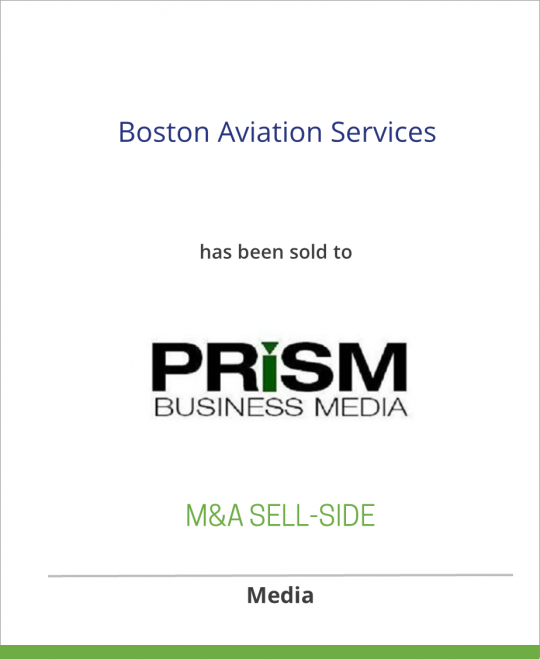 Boston Aviation Services has been sold to Prism Business Media Inc.
Boston Aviation Services, Inc. (“BAS”), located in Cambridge, Massachusetts, publishes The Air Charter Guide – the authoritative standard for the air charter industry. The Air Charter Guide is published twice each year and is the defining data source, marketing tool and advocate for the large and growing air charter industry. It offers readers in 148 countries exclusive coverage of the industry, including operator and aircraft listings, charter broker services, maps, aircraft descriptions and diagrams, air cargo and ambulance information and ground transportation services information. Users of The Air Charter Guide encompass the entire air charter field, including customers of air charter trips, their assistants, travel agents, corporate travel planners, brokers, corporate flight departments and charter operators worldwide. BAS also publishes The Air Charter Guide Executive Traveler Edition – a condensed digest-sized version of The Air Charter Guide designed specifically for corporate travelers – and The Cellular Pilot, a pocket-sized handbook, distributed throughout the world to corporate, charter and “fractionally owned” jet pilots and their flight dispatchers. Prism Business Media Inc., based in New York City and Overland, Kansas, is the entity that acquired PRIMEDIA’s Business Information segment from PRIMEDIA in October, 2005. Prism Business Media Inc. consists of 70 business-to-business targeted publications, more than 100 Web sites, 25 events and 50 directories and data products, serving professionals in 20 market sectors such as agriculture, entertainment technology, marketing and telecommunications. Wasserstein & Co., LP, along with investment partners Highfields Capital Management and Lexington Partners, led the acquisition of PRIMEDIA’s Business Information segment. Wasserstein & Co., LP is a leading independent private equity and investment firm, focused primarily on leveraged buyout investments, venture capital investments and related investment activities. The firm historically has made investments in media, consumer products and other industry sectors. Representative historical media investments have included ALM, Hanley Wood, Real Estate Media, The Deal, New York Magazine and IMAX. Wasserstein & Co. conducts its activities through offices in New York and Los Angeles.